They described themselves as an organic and natural foods emporium. All I can say, is I wish I lived nearby! They sold unpackaged ‘proper’ bread. They had glass jars of spices, herbs and other dry goods like lentils and great canisters of tea- all of which could be weighed out to your requirements. Most exciting of all, in their freezer section were these frozen vegetables- packaged in cardboard boxes and made by a Cooperative. You can read more about them here: http://www.natural-cool.com/Natural-Cool.37+M52087573ab0.0.html although it does look like they would have to be flown in from Germany. (I should add that this is my assumption and they may have suppliers based in the UK, or other countries. I personally didn’t get to taste them, as we were only on holiday for a week and would never have gotten through a box! 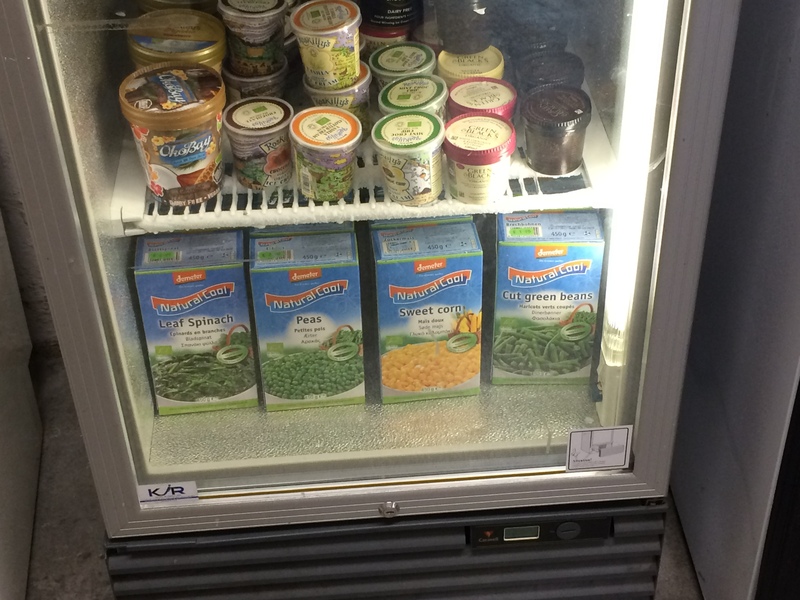 Have you found sustainable frozen options where you are? We try not to take stuff to the tip- by following the 3 R’s- Reduce, Re-Use, Recycle we are mostly able to avoid this. Freecycle is your friend people! We recently dismantled a UPVC conservatory that was on the back of our house. It took a while, but after offering it on Freecycle a few times- someone wanted it and was prepared to come and dismantle it, in order to take it away. We assisted them as much as possible and saved ourselves £2,000 in labour and disposal costs. I ended up taking only the cement from between the bricks to the tip who charged me £1.50 per bag (x6 bags), so £9 to dispose of it. Whilst I was there, a kind operative helped me to lift the heavy bags and tip them into the skip. So I got chatting to him about what happens to all the household waste that ended up here. I was shocked to learn that nothing was re-purposed and even the operatives who worked there are not allowed to remove items that could be re-used. After having lived in an area previously where all re-usable items were pulled out for re-sale at the tip (usually for only £1 or £2) & re-use, I was shocked! The operative admitted his shock at some of the items people throw away- like really decent hi-fi systems and sofas. It also made me think how lazy many human beings are- not even bothering to think if someone else might need this item, or taking it to a charity shop etc. So great was my level of concern that I decided to contact the Head of the Environmental Services Department at my local council and express my horror at what was being sent to landfill. I will let you click on the link below and discover what is now happening in my area- I am SO excited! I will make a new post after I have attended the launch event in a couple of weeks time! Our electric kettle came to the end of its life abruptly the other week, just one day before we were due to go on holiday- unhelpful! I purchased it around 2009, so it had given us about 6 years service. Not bad, until you think that if you live until you’re 90- you’ll get through an astonishing 15 kettles in your lifetime! Although, perhaps you can take off a couple, as you probably don’t drink tea before you’re 12! My other half and I had a long conversation about how we might make a better choice this time around, which features were important to us and whether we could be more zero waste. We strongly considered a stove top kettle, since we have an induction hob and they were meant to boil very quickly. I went out intending to buy one and then was put off by the price- nearly £50. I hesitated also because I have never used one and I didn’t know how I would get on with it, they all seemed to be very heavy when I tried them in-store and would be even heavier when filled with water. Furthermore, a lot of them have metal handles and I was worried that we would forget and burn ourselves! (Although I’m sure we would have learnt that lesson quickly!!!) Anyway, I got talked into a £25 electric kettle in my local, independent retailer- mostly because I didn’t have a lot of time to shop around or wait for something to be delivered. I went for the best choice they offered which was a stainless steel body but still had a plastic base and handle. It looked good and off we went on our holiday! When we returned, we quickly realised it was a poor design and the spout dripped water all over the counter constantly when pouring. A few days later, I actually burnt my foot because it started to pour down- even though I was wearing slippers! Next thing was, the plastic filter dropped out and we couldn’t get it to go back for love or money! At this point, we had been using this kettle for a mere 2 weeks! I took it back to the retailer and stated my displeasure and demanded a refund. Secretly I was glad because part of me was worried I was going to be stuck with this drippy kettle. Although, even with all my zero waste, plastic free knowledge- I was still dubious of taking a risk and was actually going to spend £70 on the same kettle we had just used on holiday! This was because I’d had the opportunity to try it and knew it worked, plus it was a very reputable brand. However, I did my usual tour of the charity shops in my local town and lo-and-behold, I came across this little beauty pictured above. I took a £5 chance on it (although they said I could have a refund if it didn’t work on my induction hob). Honestly, I wasn’t holding out loads of hope for it because it seemed quite light-weight and induction pans usually have very solid bases. I wish I had a picture of the grin on my face when it started to heat up, I even did a little fist pump when it boiled. 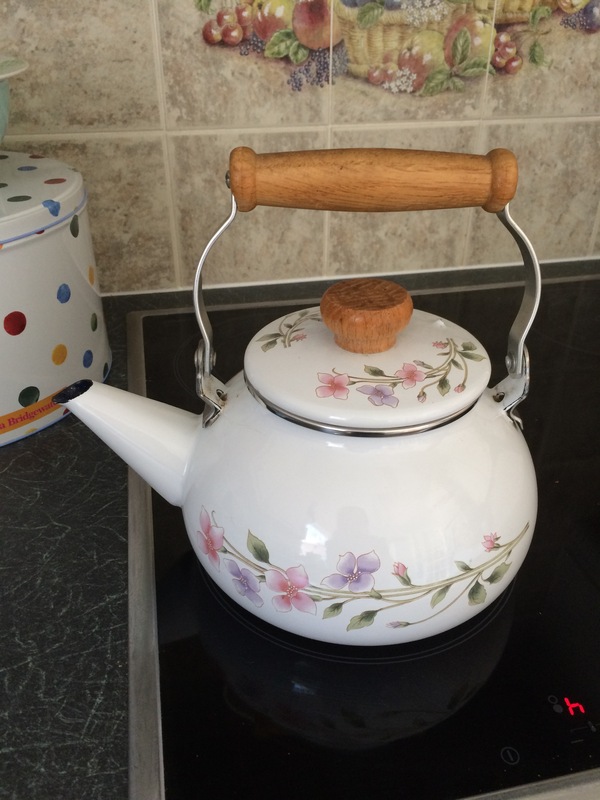 It’s a retro enamelled kettle from the 1970s or 1980s. It has one small chip on the lid and the tiniest bit of rust on the end of the spout, but overall is in very good nick. Best of all, it was second hand and has therefore been saved from the rubbish pile, it is solid metal, enamel and wood- not a bit of plastic in sight. Basically, with good care- there really is no reason why it couldn’t last a lifetime- there are no electric components to fail! It is also going to help us save water, as it can only boil enough for 4 mugs at a time- so there will be no over-filling (our last kettle could make 8 cups if filled). It really is ideal for the two of us! Plus, the double bonus is the section of work top that is now clear, as this one lives on the stove top. Long live my little floral kettle! Isn’t it lovely to hark back to simpler times? I remember my local church having an enormous enamel kettle to boil water on the stove top, in the days before urns.